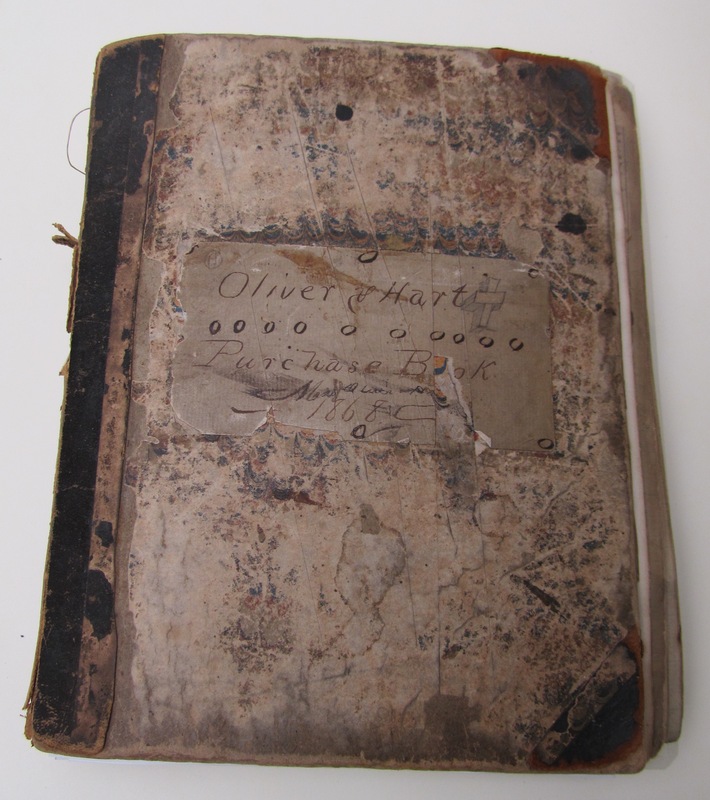 The cover (a reused ledger book) of Mr. Charles Mortimer's scrapbook. Milwaukee Art Museum, Institutional Archives. Photo by the author. “Men Who Own Big Libraries: Milwaukeeans Who Delight in Collecting All Manner and Kind of Books” (Milwaukee, Wisconsin, June 18, 1901). I found this article, that goes on to describes the book collections of several wealthy Milwaukee attorneys and local leaders, housed alongside a scrapbook in the Museum’s Institutional Archives. The scrapbook was compiled by a man mentioned in the “Men Who Own Big Libraries” article. This man was not exactly a wealthy Milwaukee industrial titan, he was more of an odd man out–a mechanic whose unique collection provides a special surprise for anyone interested in Milwaukee’s early art scene. This mechanic, Mr. Charles Mortimer (1824-1911), was a collector of the classics, including titles from such authors as Charlotte Brontë, to whom Mr. Mortimer’s family was a neighbor in England. Among his collection of nearly 2,500 books Mr. Mortimer also assembled an assortment of scrapbooks on various topics of personal interest, including a scrapbook for contemporary art affairs and related activities around Milwaukee and beyond. Advertisement within Mr. Charles Mortimer's scrapbook. Milwaukee Art Museum, Institutional Archives. Photo by the author. 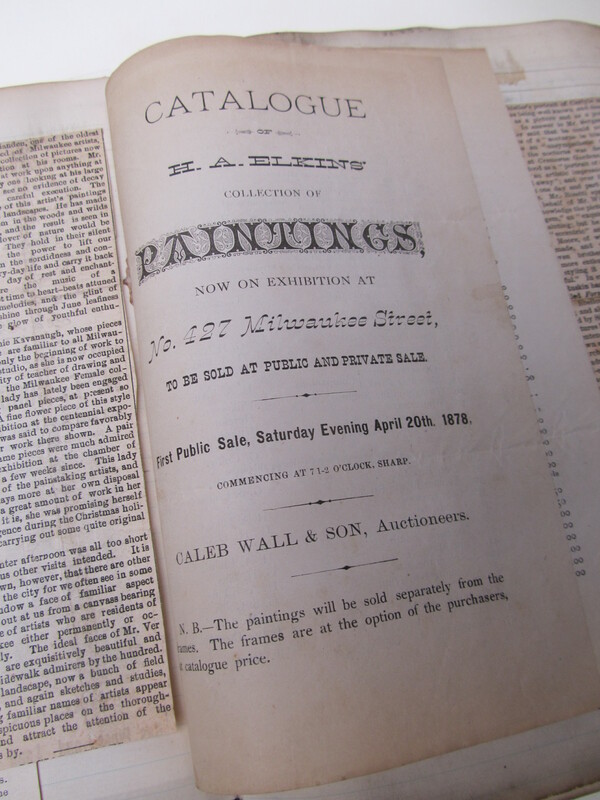 Mr. Mortimer’s arts-related scrapbook, currently in the collection of the Milwaukee Art Museum’s Institutional Archives, features a treasure trove of fascinating articles and advertisements for a young city with a growing appetite for art as early as the mid-1800s. Newspaper clippings, catalogues, pamphlets, lecture announcements and more describe a burgeoning art spirit among both Milwaukee’s established families and newest arrivals. Nestled among the materials are advertisements for local dealers and purveyors of art, including a catalogue from the Milwaukee Art Union (dated 1858), the Charity Art Gallery (located next to St. James Church as of Oct. 9, 1871) and a variety of articles for the Exposition Art Galleries (dated early 1880s) among others. News of early art galleries and art schools, including the Milwaukee Art Gallery (which continued until 1874), discussions around efforts to establish a Milwaukee Museum of Fine Arts in 1883 (that museum never materialized), along with news of the Milwaukee Art School and the Wisconsin Art Institute are scattered among the scrapbook pages. Also included is a catalogue for an 1886 exhibition of Albert Bierstadt paintings in the Colby & Abbott building (located at 759 N. Milwaukee St.) along with an 1883 article about the experiences of Wisconsin photographer H.H. Bennett. 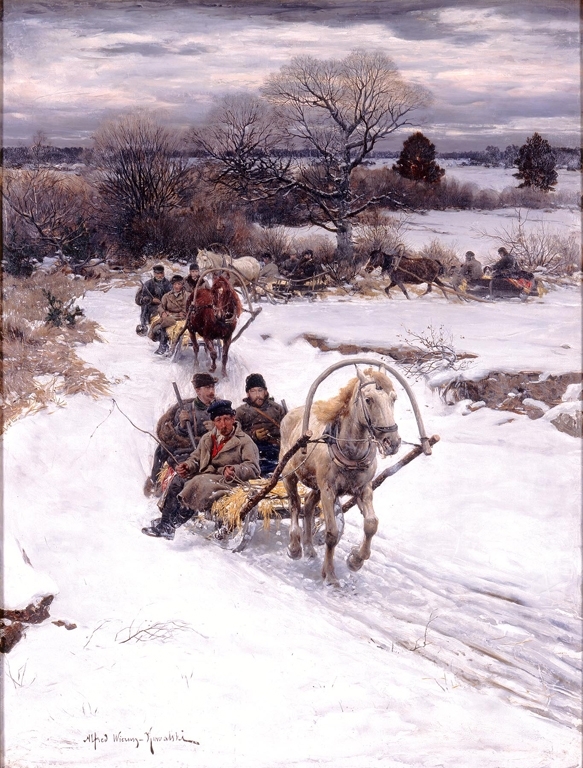 Alfred Kowalski (Polish, 1849–1915), Winter in Russia, before 1885. Oil on canvas, 40 1/4 x 30 5/16 in. Milwaukee Art Museum, Layton Art Collection, Gift of Frederick Layton, L1888.15. Photo by John R. Glembin. And, had you been available in April of 1878, you may have wished to attend an auction of the paintings of the artist and collector H.A. Elkins or take in a view of a Rembrandt painting called A Head by Rembrandt in his smooth manner at the Exposition building. That painting was owned by a resident of Sturgeon Bay whose father had purchased the painting a generation earlier from the Donati family of Italy. As for the national art scene, the scrapbook shares local details related to the spectacular 3-day Seney sale in New York (1885), when New York banker and philanthropist George I. Seney (1826-1893) was forced to sell his home and auction off nearly 300 of his paintings after the Panic of 1884. At that sale, Milwaukee’s Frederick Layton purchased Alfred Wieruz Kowalski’s Winter in Russia (at left, which hangs today in the Milwaukee Art Museum’s gallery #10) and Mr. John L. Mitchell purchased the auction’s highest priced item, Jules Breton’s Evening, Finistere for $18,350. As I read through the articles in the scrapbook, I could not help but wonder how Mr. Mortimer would view his fair city and its passion for art today. Perhaps I am a little biased, but I suspect he would be proud of our collections and art community! This entry was posted in Art, Library/Archives and tagged 19th century Milwaukee, Albert Bierstadt, Alfred Kowalski, Charles Mortimer, Charlotte Bronte, H. H. Bennett, Layton Art Gallery, Library/Archives, Milwaukee, Milwaukee Art Institute, Rembrandt. Bookmark the permalink. This is my great-great grandfather. I hope to see these items some day.